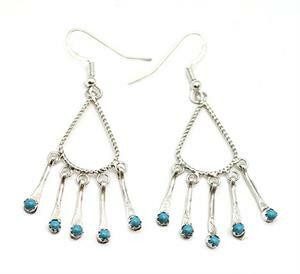 Sterling silver twist wire tear drop shape earring with 5 silver paddles with turquoise dots dangling. It measures approximately 2 3/8" long including silver plated french wires by 3/4" wide at widest. It is Navajo hand made by Michael Bitsie. Turquoise stones will vary in color shade.